By Amy Hoover. Published in Pilot Getaways Magazine, 1999. Upon visiting the Idaho backcountry for the first time, pilots will see an airstrip nestled in the trees at the bottom of a deep, possibly narrow canyon and ask, “What must I do differently to make a safe approach into such a constricted area?” The answer lies not in what they must do differently, but in what they can do to make the approach as “normal” as possible. It is best to fly a standard traffic pattern whenever practical, as it affords a pilot with familiar visual references. 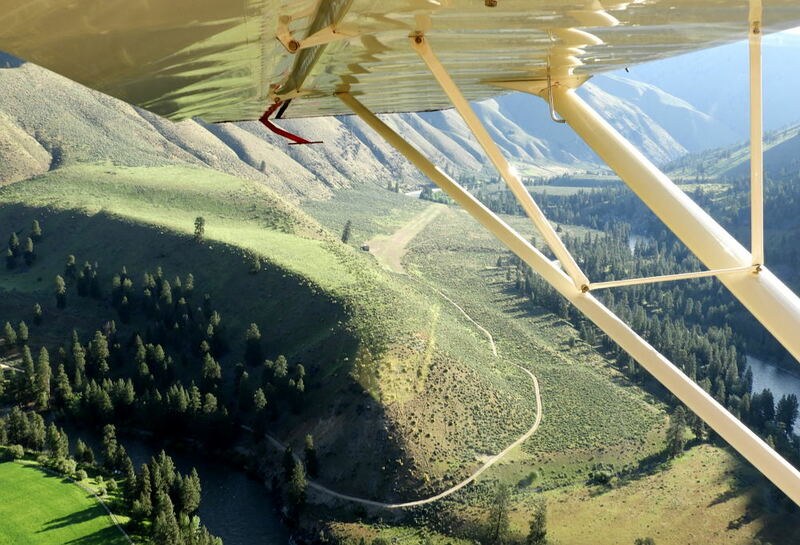 You can fly a normal traffic pattern at many of the popular Idaho backcountry airstrips, including Big Creek, Johnson Creek, Moose Creek, Flying B, Thomas Creek, Indian Creek, and Upper Loon. The two most common errors new backcountry pilots make is to fly an approach that is too high and too fast, or to fly up or down the canyon out of sight of the airstrip, turn around, and drag the airplane in on a low, flat, blind approach. Both can be deadly, and both stem from a lack of application of basic principles that backcountry pilots consider second nature. The first of these principles is an understanding of the relationship between airspeed and turn radius. Turn radius at any given bank angle is proportional to the square of the airspeed. By decreasing your airspeed you will reduce the area needed to turn in a canyon. For example, at 130 knots in a 30˚ bank, your turn radius would equal 2,599 feet, which means you would need almost one mile to execute a 180-degree turn. If the canyon you are flying in is only 3/4-mile wide, this could be deadly. Decreasing your airspeed to 70 knots will decrease your turn radius to 753 feet, which means you can turn 180 degrees in about one quarter mile, or in less than half the width of the same 3/4-mile wide canyon. Generally, you will not want to exceed a medium bank when flying in canyons for several reasons. First, when maneuvering in a constricted canyon the terrain is above and beside you, and you will not have the visual horizon to which you are accustomed for reference; it can be disorienting, confusing, and deadly to “bank and yank.” Also, increasing your bank angle beyond 30˚ will rapidly increase the load factor and stall speed of the airplane. In addition, passengers don’t appreciate steep turns—especially in narrow canyons. Thus, slowing down is a key factor to flying in a constricted area and executing a good approach to a canyon airstrip. Also paramount is the understanding of how to fly a power-on stabilized approach with a steep (4 to 4.5-degree) approach angle to a precise aim spot. The FAA defines a stabilized approach in the Private Pilot PTS as “an approach in which the aircraft is in a position where minimum input of all controls will result in a safe landing. Excessive control input at any point could be an indication of improper planning.” A major part of this planning is to determine what pitch and power settings will produce the best approach airspeed and pitch attitude for your airplane at a given weight and center of gravity. Sparky Imeson has a good discussion of this steep, backcountry approach technique in his Mountain Flying Bible. By approaching at a steeper angle you can clear obstacles, see the runway better, and be in front of the power curve instead of “dragging it in” on a long, shallow, slow, mushing approach. You will also have a shorter ground roll. The FAA also states: “Experienced Pilots know the power settings and airspeeds for different landing weights, drag configurations and rates-of-descent for their airplanes” (FAA-P-8740-49). If you know how to listen, an airplane can “tell” you what airspeed, flap, gear, and power settings will work best at a given density altitude, weight, and center of gravity. Before venturing into canyon areas, you should seek out an experienced instructor who can help you with this. I generally work with a pilot through a series of maneuvers developed at our flight school to determine a good “canyon speed” for maneuvering in constricted areas, as well as the correct pitch, power, and airspeed to use for a stabilized approach in their airplane. Then we practice, practice, practice. Many backcountry airstrips are one way in and out, so once you are committed, there is no go-around option; you need to know ahead of time how you will set up and execute your approach. To avoid flying approaches that are too high, use your altimeter. When approaching the landing area, slow to your canyon maneuvering configuration and airspeed. Circle the field at 800-1000 feet and check wind sock(s), look for game on or near the runway, check the runway surface condition, locate obstacles, note terrain surrounding the approach and departure paths, plan your departure, and locate any emergency landing spots to use in the event of an engine failure. One of the first things my primary flight instructor told me was to always keep the airport within sight and within gliding distance—excellent advice. If you have the aircraft properly configured and established for a stabilized approach, flying a normal traffic pattern is straightforward at many backcountry airstrips. I have found the reason pilots are hesitant to “get down” into a canyon is a visual one. You must accept the fact that you will be flying much closer to the terrain than you are accustomed. Always remember that the worst place to fly is in the middle of a canyon; it leaves you no room to maneuver and you will encounter the worst turbulence, as well as create a collision hazard with other aircraft. Fly along one side of a canyon—preferably the downwind side—to give yourself maximum maneuvering room. Avoid flying away from the airstrip and around a blind corner to return for an approach. A common place I see this is at Johnson Creek, where pilots descend over the town of Yellow Pine, more than three miles away, and enter a narrow canyon in a blind approach to the airstrip. When doing this, they cannot see or been seen by pilots flying a normal traffic pattern and they have no radio communications. I have flown normal traffic patterns resulting in a good 3/4-mile final at Johnson Creek in a myriad of aircraft, including Bonanzas, Mooneys, P210’s, and light to medium Piper and Cessna twin engine aircraft, so I know it is not necessary to fly around the corner to execute an approach. The bottom line is, know your airplane, know yourself, and seek out someone with the knowledge and experience to help you maximize precision, control, performance, and safety when operating in mountain and canyon areas such as the Idaho backcountry.